Mt. Shasta lies in Northern California about 50 miles from the Oregon border. Among peaks in the lower 48 states, it's the third most prominent mountain, and the second highest volcano, at 14,162 feet. You've probably seen it to the east if you've ever driven between California and Oregon on I-5. I led a group up the Avalanche Gulch route last Friday and Saturday. Dave, Steve, and Margie, all from my church, joined me for the climb. Having a group of great people that was just the right size made the trip a lot of fun. I became a little worried as I monitored the weather during the week before the climb, since it looked like there would be storms in the area the weekend that we were there. Besides making our trip cold and wet, storms could increase the chance of lightning strikes and avalanches. However, we had already taken work off, and it would be difficult to reschedule, so we decided to go as far as we could, and turn around if conditions were bad. I estimated our chances of summitting at below 40%, but figured we'd still have a good time and might get lucky and make it to the top. We made the five-hour drive to Weed (a few miles north of the town of Mount Shasta, but with much cheaper rates) on Thursday night and stayed at Motel 6. We awoke on Friday morning to a beautiful view of the mountain from our motel balcony and headed to The Fifth Season (recommended!) in Mount Shasta to rent boots, ice axes, and crampons. After breakfast at a local cafe, we made the short drive to the trailhead, which is at 6,900 feet. When we arrived, a glance at parking lot made it apparent that we weren't going to be the only ones on the mountain. After filling out our wilderness permits and getting our gear together, we hit the trail a bit before noon. We made a quick stop at the spring at Horse Camp (a Sierra Club-built cabin low on the mountain) to refill our water bottles and then got down to the business of mountain climbing. Our goal on Friday was Helen Lake, a flat, protected area at 10,400 feet where we would camp for the night. The route past Horse Camp was almost entirely on snow, but the snow was firm, which made our ascent relatively pleasant. We followed the climber's gully up to the main Avalanche Gulch drainage, and from there continued the additional 1000 vertical feet to Helen Lake. The weather changed every 10 or 15 minutes along the way, alternating between rain, clouds, whiteout (fog), graupel, and an occasional sunbreak. The clouds cleared right as we reached Helen Lake in the late afternoon, giving us a great view of the route that we would be climbing the next morning. So far, so good with the weather! 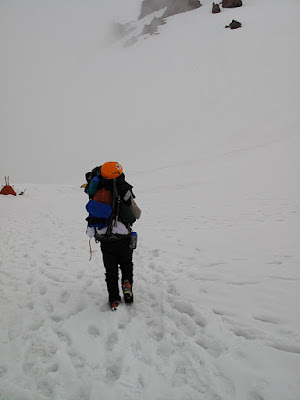 We shoveled out our tent platforms, set up our tents, boiled water for our freeze dried meals, set out our gear for the climb the next morning, and were in bed by 8 p.m.—the earliest I've gone to bed in months! I set my alarm for 1 a.m. before going to bed, and 1 a.m. came pretty quickly. I crawled out of my warm sleeping bag, pulled on a coat, and poked my head out of the tent: whiteout! Since none of us had been up the route before, I didn't want to start with zero visibility, so I decided to wait an hour. 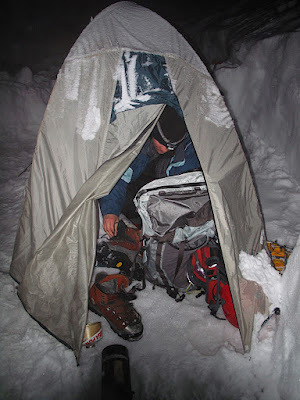 When my alarm went off again at 2 a.m., I awoke to the sharp sound of graupel hitting my tent. I poked my head outside again, and my headlamp could only pierce a few feet into the whiteout. Back to sleep for a bit, but I was worried because we couldn't wait much longer to start hiking. Thankfully, when I woke up at 2:30, it was perfectly clear outside. I could see the stars, and the moon was beautifully illuminating our route up the mountain. Time to climb! I woke up the others, ate my Mountain House granola with berries (mmmm! ), put on my boots, and crawled out of the tent. It took everyone else a while to get ready, so we didn't leave until 4 a.m. Climbing a mountain early in the morning is one of my favorite things in the world. I love the quiet solitude, the serene beauty, the simplicity. I love the bright sparkling stars and the moon that's almost within reach. I love the ominous silhouette of the massif ahead, and the knowledge that I'll soon be above it. I love the faint, deep blue glow of the sky an hour before sunrise, turning to a creeping orange and then endless shadows as the sun rises. Our climb was pretty straightforward. We pulled out the crampons and ice ax a little way up the mountain as the snow became steeper and icier, making slow but consistent progress. As we climbed, I taught the group about the rest step, crampon technique, and ice ax belay and self arrest. The Avalanche Gulch route is a good one for beginners, since it's not too steep, and the runout is pretty tame if it's not super icy. It's a good place to learn. As the sun rose, so did the clouds, and we passed in and out of a whiteout. However, there was a pretty good boot track, so we just followed our unseen predecessors as we continued upward. The route follows Avalanche Gulch for a few thousand feet, and and eventually meets a set of loose, red rocky cliffs known as the Red Banks. A few moderately steep chutes cut through the cliffs, and we followed one of these up to the ridge just above the Konwokiton glacier. From there the route was a little less steep, and we pressed on to the false summit above Misery Hill, passed the steaming volcanic fumaroles, and from there to the true summit. We arrived around 10:30 a.m. The sky was clear above the summit as we stepped onto it, but the clouds that were building below limited our view. They were billowing up pretty quickly, so we snapped a few quick pictures and then headed down to avoid getting caught on top in a possible thunderstorm. We did a little self arrest practice when we reached the ridge above the Red Banks, and then Dave and I headed down. We were going to descend quickly and start taking down the tents while Steve and Margie brought up the rear. After climbing down the rocky Red Banks, we glissaded a lot of the rest of the way down, using our axes as brakes. The snow was perfect for glissading on the upper mountain, and there was already a nice track packed down by other climbers, so we made really good time. The snow was too soft and the slope too moderate to glissade for the last 500-1000 feet, so we had to walk. We reached the tents around 12:15 p.m. It had started to precipitate by the time we arrived at the tents. At first it was graupel, but it soon turned to wet snow, and then sleet. It started coming down really hard for a while, so Dave and I holed up in the tents, packing up gear inside. It stopped after perhaps 30 minutes, and then the sun came out. The temperature rose from around 40 degrees to what must have been around 80, with 100% humidity from the sleet that had just fallen and the lingering cloud. It felt like a sauna! After packing up everything, we headed down to the car. It rained on us partway down, but we were already soaked from sweat and humidity, so a little more moisture didn't hurt. The warm temperatures had softened up the snow a lot, which made for a great plunge-stepping descent, but we felt really sorry for the people trying to slog up the sloppy wet snowfield. We were really glad we had come a day earlier! After dropping off our rental gear, we stopped at Mount Shasta's only pizza place for every child's dream meal: pizza and ice cream. :) The drive back was long, but uneventful, and we made it home a bit before midnight. I'm really starting to like these Cascade volcanoes. I'd love to climb Hood and Shasta again, but I'd also like to hit the other big peaks: Rainier, Adams, Baker, St. Helens, and maybe Jefferson. I wonder why no one has commented on this entry yet? You pretty much PERFECTLY captured my love of being up high on volcanoes. That description of the solitude and beauty of the snow in the hours before and during sunrise was just what I feel and love about those climbs. Thanks for putting it to words with the pictures.